The RL25HVCK is a horizontal and vertical dual beam single-slope interior and exterior rotary laser that delivers professional performances at an affordable prices. The RL25HVCK is ideal for exterior and interior general construction and aligning jobs such as grading, concrete forms and pads. Includes: remote, target, wall mount and case. 3/32 in. 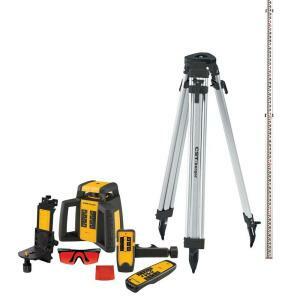 leveling accuracy and extended range of 2000 ft.
Tbook.com crawls the web to find the best prices and availability on Levels and related Tools and Hardware products like CST/Berger 2000 ft. Self-Leveling Horizontal/Vertical Rotating Laser Level Kit (10-piece). For this page, related items include products we find that match the following keywords: "Level" at our vendor partner Home Depot. CST/Berger 2000 ft. Self-Leveling Horizontal/Vertical Rotating Laser Level Kit (10-piece) is one of 154 Levels and related products listed in the Tools and Hardware section of Tbook.com If you have any questions on this product, please give us a call at 734-971-1210 during the hours of 9am - 5pm EST for assistance. Thank you for shopping at Tbook.com, the Internet Department Store!